EU lawmakers are set to vote on a controversial copyright reform that could change how internet companies treat uploaded content from users. A version of the proposal was rejected in July after a grassroots campaign, and fierce campaigning on both sides. Critics fear the rules are too broad and could affect parodies, remixes, and even links to articles and websites. But many musicians, authors, and other creators back the reforms which they view as necessary to support artists. Hundreds of changes have been made since the July vote, but opponents say major issues remain. The proposed copyright directive is supposed to protect creators by forcing payments to be made to them if their work is copied or linked to online. Most of it is not controversial, and the debate is centred around two sections: articles 11 and 13. 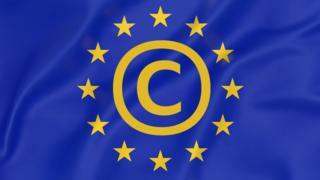 Article 13 has attracted the most attention, and been labelled an "upload filter" by critics. If a user tries to upload copyrighted music, photos, or anything else, it must be checked against a database - and filtered out if it contains copyrighted material. Effectively, it makes sites like Facebook and Youtube responsible for what its users upload. But with more than 400 hours of video uploaded to YouTube every minute, no human could do the job - filtering would need to be done automatically by computers. Such systems are both expensive and often criticised for being over-zealous and filtering anything that might be copyright-protected. For example, some people believe that background music playing in a family video could be filtered out, or that small samples of copyrighted content in a parody or internet meme image could be enough to trigger the automatic filter. The possibility has led to such systems being labelled "censorship machines" by some opponents. MEPs behind the directive say such claims are wrong, and have decried what they see as a misinformation campaign. The other debated section, article 11, seeks to grant new rights to news outlets and publishers, giving them a slice of revenue from aggregators like Google who link to their content. But the broad nature of the rules led to fears that even simple hyperlinks or short "snippets" could be costly - potentially affecting a core part of how the world wide web functions. Who is for and against? Many creative industry associations continue to campaign for the directive to be implemented - including Britain's record label group BPI and the Society of Authors. Supporters say the new rules will protect artists and creators, making it easier for them to earn a living - and that the amendments made since July should assuage concerns. Record labels have campaigned for the reform to go ahead, along with music titans like Sir Paul McCartney. Ahead of the July vote, some 1,300 musicians declared support for the changes, which would require websites like YouTube or Facebook to detect and delete user uploads of copyrighted music. But the divide between those for and against is not entirely clear-cut. Musician Wyclef Jean of the Fugees, for example, is in Strasbourg campaigning against the changes, which he believes will actually hurt musicians. And while some critics say the changes will hurt small businesses to the benefit of existing internet giants, those same giants - including Facebook and Google - also oppose the directive, which would make them liable for content uploaded by their users. The July vote was defeated 318-278 after thousands of ordinary people contacted their European representatives following a grassroots campaign. But under European parliament rules, that meant it would be amended and debated before going for another vote, due on Wednesday. More than 250 changes to the original text have been proposed. "This vote is our best chance to prevent EU copyright reform from causing lasting harm to the open internet," MEP Julia Reder said in a blog post criticising many of the proposed changes. Digital rights group the Electronic Frontier Foundation, meanwhile, said the proposal was "so terrible, it can only be called an extinction-level event for the internet as we know it". French MEP Marc Joulaud told the AFP news agency, which also backs the measure: "The feeling of many in parliament is that on Wednesday we decide the life or death of the law." "We can still finish on time if the text passes on Wednesday. This is the last slot," he said.